Designing apps that earn people's trust over time, rather than presuming it from the start, requires us to think more deeply about the approach to data collection. Oink is a fictional challenger bank aimed at a younger market who don't rely on branch-based services. 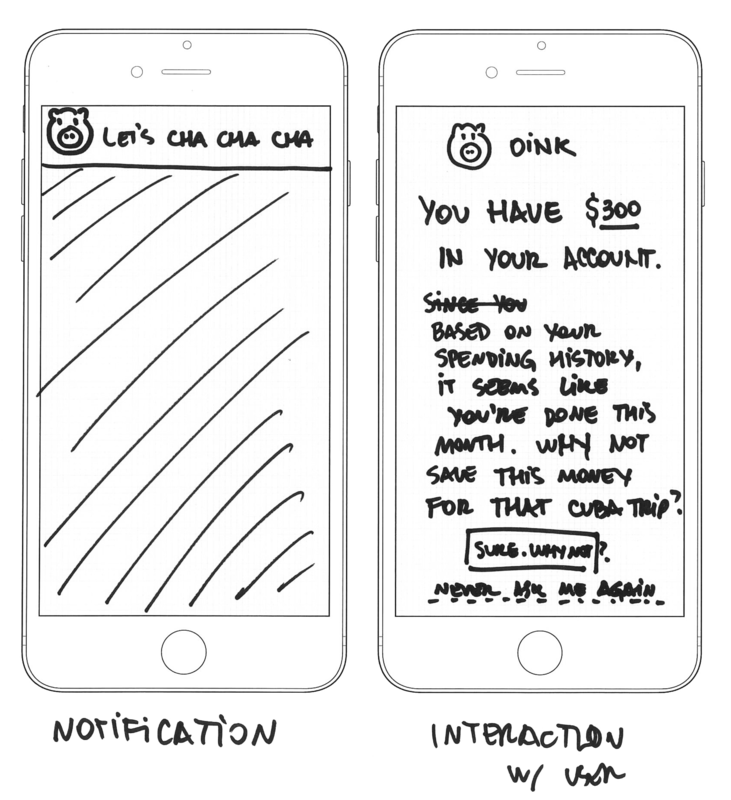 Oink aims to make people’s spending habits more visible, and to encourage short and long-term saving. To do this effectively, Oink relies on data relating to people's daily purchases, cash movements, and displays suggestions to guide them towards meeting financial goals. The handling of personal data is particularly challenging for Financial Tech (FinTech) apps and services because, on the one hand, there's a high level of trust required when allowing a company to look after your money, while on the other hand you may be hesitant to give up too much personal data without feeling reassured that they're worthy of your trust. ...take a human/conversational approach to asking for data? 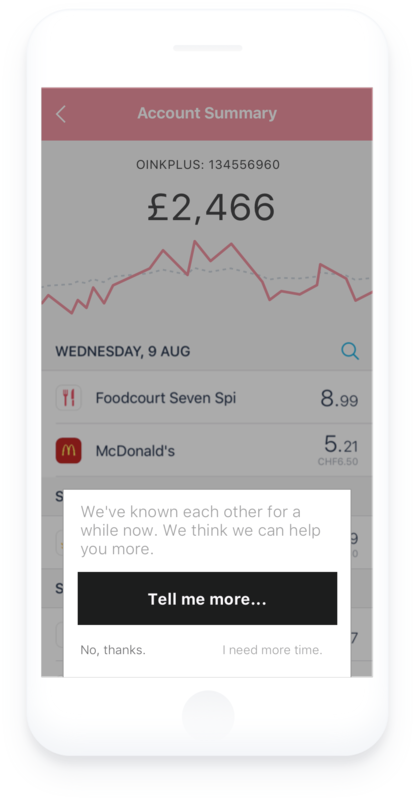 After 100 days of using the app and completing more than 100 transactions, Oink reaches out in a contextual micro-interaction with a friendly reminder, 'We've known each other for a while now. We think we can help you more.' People can choose: 'Tell me more,' 'No, thanks,' or 'I need more time.' This human approach does not presume that trust has been built, and instead gives a person the choice to engage rather than Oink presuming the use of the person's data to drive other new features or services without their knowledge. You always pay your bills on time. Can we remind you from time to time to save money? You like chicken a lot, huh? Can we notify you about food offers near you? You have a regular income of £50 per week. Can we let you know ways to invest and save? People are more likely to try new things with their data and allow new features if they are confident they can change their mind or simply retrieve options anytime. Within Oink, a privacy overview panel is accessible anytime from a settings icon located in the top bar with the helper text that notes, 'Don't worry, you can update your choices at any point.' A person can turn off/on these choices and other data at a later date. As it happens, the team behind these designs intended to take its interactive potential one step further through a chatbot feature. While this idea remained at sketch stage in Sao Paulo – and because great minds think alike – this solution was explored by the Oink team in Dublin! Explore a chatbot experience that could feel even more human and trustworthy?